When I decided to convert this tool shed into my home, I didn’t have much money. I’d just returned from five months of traveling adventures and my wallet was empty. I returned to Vermont in mid-September and had exactly one year until my parents were hoping to be moved out of their house. That meant I had exactly one year to figure out where I was going to live once they moved. Since one of my main reasons for not living in a traditional house was to avoid both rent and debt, I needed a low-cost solution. Hence, a tool shed converted to tiny house sounded mighty fine! In addition to financial benefits of reusing materials there are ethical ones as well. The process of creating, selling, and transporting new materials is hard on the environment, as is the disposal of old materials. Reusing products that would otherwise go to the dump, saves on both ends. What is upcycling? While we are all familiar with recycling, the idea of upcycling goes one step further. Upcycling can be as simple as reusing or re-purposing an object. Recycling plastic into more plastic costs money and the end result is generally of lesser quality than the original item, so the process has a net cost. The idea of upcycling is to increase an objects usefulness and/or eliminate the processing or disposal costs associated with an item, thus providing a net increase in the objects value. Upcycling is generally associated with taking useful items out of a building that is being renovated or torn down and re-purposing those items. This makes an object that is slated for the dump (financially and ecologically expensive) into a valuable addition to a new project. My introduction to the idea of upcycling and reusing/re-purposing building materials came from the great folks at Community Forklift, just outside of Washington DC. I used to spend hours looking through boxes of cool old gadgets and dreaming up ways to build new things out of old. In fact I visited DC while I was building this house and got a selection of light fixtures at Community Forklift and brought them home with me, they are in my house now. As soon as I started thinking about this project I sought out all the similar places in Vermont. I ended up purchasing items for my house from both locations of Vermont’s ReStore (Burlington and Barre) as well as Renew Salvage in Brattleboro and Vermont Salvage in White River Junction. When I’m in a reused building supply store I get lost in day dreaming of future building adventures! My first step in renovating my new tool shed home was to gather materials that would otherwise be thrown away and figure out how to use them. Other than some screws and an occasional 2×4, I bought almost no new materials. Much of the interior design of my house was born based on the materials available, not the other way around. Before I did anything else I needed doors and windows. The antique wooden barn door now painted blue would have to go. I didn’t want to get rid of it since it was the original door on my grandparents house before it was winterized. Too much history there, it will be once again re-purposed as the door on my tool shed (though here I am 2 years later and it’s still in the shed, waiting to be hung!). I scavenged through several reused building material stores around Vermont, as well as through piles of doors and windows in various friends barns and found two downstairs and one upstairs window, as well as an exterior door. Each opening needed to be re-framed to new rough opening dimensions, but I was able to do almost all of that by saving and reusing the materials that were already there. While its time consuming and annoying to remove nails in order to salvage wood, it’s worth it to decrease wear and tear on the environment, and your wallet. This antique blue door goes back in my family several generations so while it wasn’t warm enough to leave on my house, it will adorn my tool shed. Thanks to the ReBuild Store in Burlington, the upstairs loft access door is now a crank open window big enough to be an escape route in case of fire. I had the house insulated with a combination of blown in cellulose, an insulation whose base is recycled newspaper, and two inch foam board I bought at Renew Salvage in Brattleboro. It was worth the nearly three hour drive to get enough insulation at a tiny fraction the cost. In addition to Renew stores, my stepfather Steve is a carpenter and was able to hook me up with lots of hand me downs. At the time he was building a large new home just a few miles from town and they were siding their house with one by pine ship-lap siding, planed smooth on one side and grooved on the other. They were throwing away any pieces that had more knots that they liked. I offered to take them off the hand, saving them disposal fees and helping me immensely. Since I think knots are pretty and I didn’t have any interior walls longer than about 10 feet anyway, their scrap was perfect for my interior walls. I put the grooved side out on the walls, so that I could flip the boards to smooth side out to use for door and window trim. I had so much of this wood I ended up using it to build most of the built in shelves throughout the house, as well as the box my composting toilet lives in. Throughout the winter I continued to collect materials. A section of kitchen counter came out of the store by my house when they renovated. I nabbed piles of perfectly fine tin roofing from a friends re-roofing project which now adorns my shed and the small shed roof addition to cover my propane tanks. My kitchen cabinet doors came off an old kitchen cabinet whose shelves had rotted through and were slated for the dump. Nearly everything I used I found in a free pile of one sort or another. This project was truly a lesson in how much good stuff is wasted and available for salvage if you open your eyes. I still have lots of items around the house (and yard) that I have yet to find a unique purpose for. A wood-stove sits in my shed awaiting a building to warm and there are still piles of roofing metal out by the compost waiting for a building that needs a roof. Leaning up against my house are two large glass doors I removed from an old display freezer before it’s trip to the dump. Someday those doors will help warm veggies in my not yet built cold frame. I am constantly dreaming of new projects and have a list of ideas a mile long. There is a chicken coop that needs building and I’ve always wanted a wood fired sauna. So I have no reason to stop collecting goodies I find on the side of the road and much to my parents chagrin, will likely keep building sheds to store them in. Did you have to buy the land this is built on? How much are the property taxes? Did you have zoning issues when you moved in? Where does the water come from? Electricity? I’m curious about your monthly expenses. 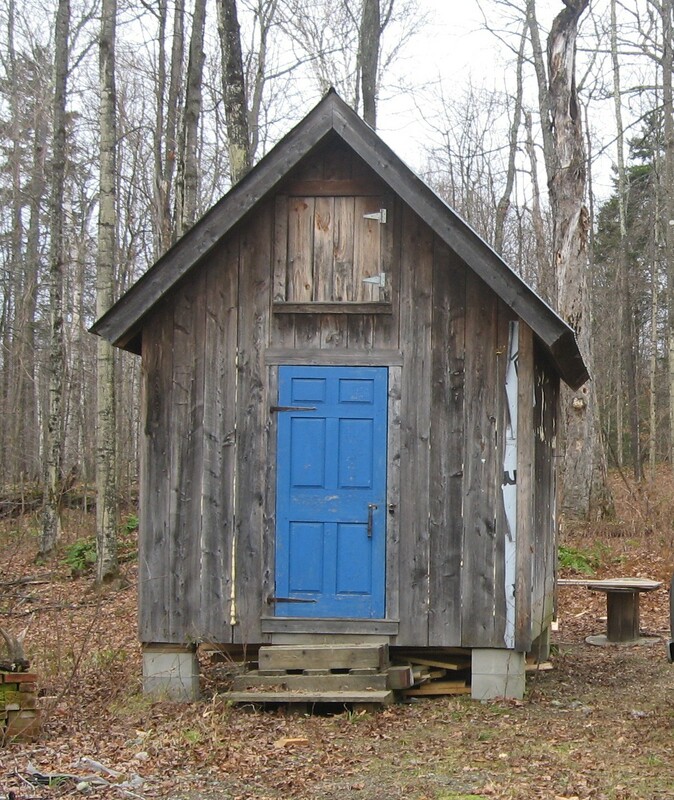 Vermont winters are COLD; do you stay warm enough in your shed? We love questions! Jamie built on her parents’ land so we didn’t buy the land separately and she renovated the inside of a shed that was already on the property. Jamie fills water jugs at her parents’ house and we use them with our redneck water system. The shed is the hub for electricity from the road then continues on to her parents’ house a few hundred feet further back so we have electric and even wifi. We pay for phone, internet, and cell phones monthly and our propane is fill-as-needed. We probably pay $225 for our tech habits each month, and maybe $400 per year for heating and cooking propane. It wouldn’t even be that high if I didn’t sometimes work from home 🙂 Jamie super insulated when she built the house so we stay nice and cozy. We keep the heater on “pilot” every night when we go to sleep and it’s only a bit chilly when we get up in the morning. Sounds pretty cool. 🙂 I’m about to move into 450 square feet, and I already know I need to get rid of a lot more than I already have. The books are the worst. The thought of getting rid of them breaks my heart.